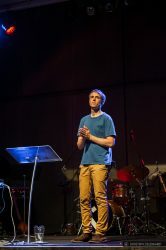 Mark Sayers is the Senior Leader of Red Church in Melbourne, Australia. He provides visionary leadership and teaching for Red Church and is gifted in prophetically speaking into the intersection of faith and culture. Mark is married to Trudi, and they have a daughter, Grace, and twin boys Billy and Hudson. Mark has written a number of books that speak directly into leadership, culture and identity. These include The Trouble with Paris: Following Jesus in a world of plastic promises (Thomas Nelson 2008); The Vertical Self: How biblical faith can help us discover who we are in an age of obsession (Thomas Nelson 2010); The Road Trip that Changed the World: The unlikely theory that will change the way you view culture, the Church, and, most importantly, yourself (Moody 2012); Facing Leviathan: Leadership, influence and creating in a cultural storm (Moody 2014); Disappearing Church: From cultural relevance to Gospel resilience (Moody 2016) and Strange Days: Life in the Spirit in a Time of Terrorism, Populist Politics and Cultural Wars (Moody 2017).